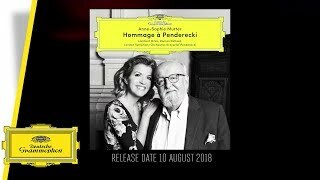 A sensitive and moving homage on the part of Anne-Sophie Mutter to a musical friend whose Second Violin Sonata she has recorded for the first time, "Hommage à Penderecki" reflects Krzysztof Penderecki’s unique musical language in fascinatingly intense and multifaceted ways. Hear him talk about composing (with both hands!). "Hommage à Penderecki" brings together various pieces that the composer has written for the violin. The Second Violin Concerto – subtitled Metamorphosen – was premiered by Anne-Sophie Mutter in 1995. 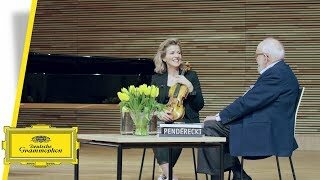 Anne-Sophie Mutter and Krzysztof Penderecki discuss the sonata "La Follia" on the album "Hommage à Penderecki"
To mark Krzysztof Penderecki’s eighty-fifth birthday Deutsche Grammophon is releasing a double album showcasing a number of the composer’s works for violin and piano or violin and orchestra. All of them feature the violinist Anne-Sophie Mutter, whose name is closely associated with that of Penderecki. 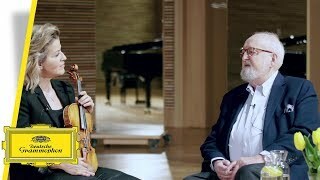 Here, Mutter and Penderecki speak of his Second Violin Sonata, which Mutter has recorded for the first time. The violinist Anne-Sophie Mutter and the composer and conductor Krzysztof Penderecki are among the leading musical figures of our age. For more than thirty years these two outstanding musicians have been close friends, and during that time their friendship has proved a fruitful one, repeatedly inspiring and challenging both parties. To mark the composer’s eighty-fifth birthday Deutsche Grammophon is now releasing a very special double album featuring Anne-Sophie Mutter both as a soloist and in partnership with a number of colleagues.